In space nobody can hear you scream...or curse. My recent foray into board gaming had me searching for a co-op board game that also allowed for a bit of solo play and I happened across this little gem of a deck builder that is Upper Deck's Legendary Encounters: An Alien Deck Building game. 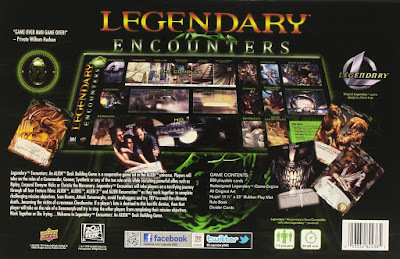 With several accolades including being nominated for the 'Best Game Theming' and 'Best Co-Op Game' on the Dice Tower Gaming Awards and ranked at 58 and with a score of 8.0 on the BoardGameGeek, the game is set in the Ridley Scott Alien universe and plays through the first four movies. No Prometheus, you are not welcome here. As a huge fan of the Aliens franchise I was excited by the prospect of a board game and was curious to see how the theme and atmosphere of the movies would be integrated. Off the bat, let me just say that this game is positively dripping with Xenomorph-acid theme! The eeriness, tension and unexpected nature of the hive deck will have your heart thumping and chest bursting as you scramble to 'un-hug' your face. I've played through the first two scenarios (i.e. the first two movies) and the script and pace of the movies has been perfectly incorporated into the game. Ripley, Dallas, Hudson, Newt and all the rest of your favorite characters from the movies are here (even Jonesy!) and while the game play sort of follows in sequence (i.e. you play through each movie with a separate set of decks for each), you can mix decks or combine them all into a custom scenario. Better still, there's also a Predator version of the Legendary family and the two games are fully compatible and combined with Aliens, well, you get the idea. Freaking Aliens VS Predator man!! Well, the game is a deck builder which, as far as components go, is just a bunch of cards. A lot of cards. Six hundred cards in fact! And...best of all, a huge jaw-dropping awesome roll-up gaming pad/board which mimics the interior of a ship or facility. When you first open the box, you're going to be tasked with sorting the randomly packaged cards into appropriate decks and while this may seem daunting and tedious for some, it appeals to my OCD nature in an gleefully sinister ego-maniac manner. Plus Upper Deck has thrown in lots of useful dividers. I settled on sorting the decks by movie, separating the objectives, hive and barracks decks for each and keeping the other decks (sergeants, grunts and specialists, avatars etc) as stand-alone. The rule book is fairly easy to understand and with a useful turn reference printed on the back. I strongly recommend sleeving the cards as they do see a lot of shuffle and play. The initial set-up has you select a location card which is different for each of the four scenarios. The first scenario sets you on board the Nostromo (from the first Alien movie), the next has you battling it out in Hadley's Hope (from Aliens) etc. Each scenario has its own set of objectives (three for each) which you need to complete as well as three corresponding hive decks containing all sorts of nasties. At the start of the game, each hive deck gets shuffled and stacked face-down on top of each other in the 'Hive' space of the board. 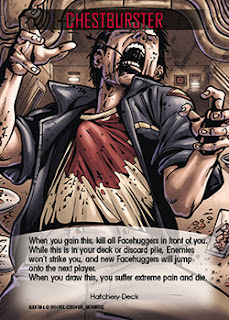 The character deck for the scenario being played is placed in the 'Barracks' space of the board and the top five cards are selected face-up into the barracks. These are the characters available for purchasing/ recruiting into your hand this turn and are replenished by drawing the top most card from the deck and adding it back into the barracks each time a card is purchased. Next, each player select an avatar which is placed face-up in front of them. You could pick between being a commander, a gunner, a medic, synthetic or one of those Weyland-Yutani a-hole execs. Everyone gets a starting deck of Grunts (for attack) and Specialists (for recruitment) as well as the avatar's corresponding unique card. Your starting deck is shuffled, six cards are drawn and play begins. As this is a co-op game, the choice of who-goes-first is entirely up to you (send the Android). At the start of each player's turn a new card is drawn from the hive deck and placed face down in the complex. The complex is a series of rooms through which the aliens from the hive deck will traverse before eventually reaching the combat zone where they star dealing out a world of hurt to you and your motley crew. While in the complex though, cards from the hive remain face down. You may 'reveal' a card in the complex by scanning the appropriate room by paying the attack cost indicated. Beware though, that while it is critical to scan a room and reveal cards, some cards in the hive deck have unpleasant surprises in store including events which may trigger on an objective (such as the alien Queen abducting your characters and taking them to the hatchery!) or hazards which may trigger on a location ("They cut the power!"). 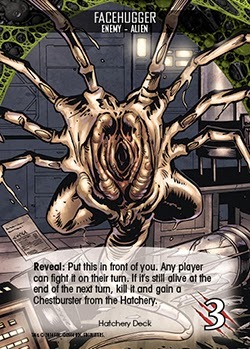 Most of the hive deck comprises aliens though, in all shapes and sizes from simple alien eggs (deliciously deadly) to skittering xenomorphs, twin mouths, acid sprayers and warriors. And then of course, there are the dreaded Face Huggers, which when revealed get attached to your face (well to your avatar card but you're more than welcome to stick the card to head as well if you so dare!). If you or your teammates are unable remove the beast by end of turn, you gain a 'Chestburster' from the hatchery deck which effectively means that you die...but you don't die because you get resurrected as an Alien player and now you're the enemy hunting down your old teammates and dealing them a painful and torturous death muah hahahaha! The deck building strategy is fairly straightforward. You have a hand of cards with either attack points or recruitment points and may spend these in combat or for room scanning or to recruit additional characters/ cards from the barracks into your hand. When you recruit new characters from the barracks, they get placed into your discard pile which is shuffled once your draw deck is diminished and a new hand of six cards is drawn. Simple and effective. Characters cards that you recruit have unique abilities which may boost your play style. Additionally, there are card factions and sub types around which you may construct your deck. Yes, you get recruit Ripley, Hudson, Bishop and the rest of your favorites! But with new aliens spawning from the hive deck each turn, your strategy needs to be fast. Combat is basically squaring off health points from an enemy card against your attack cards in play. If you match that alien's health, you have defeated it and the card gets removed from the game (along with any additional 'when killed' directives resolved). Of course the game is also co-op which means you and your teammates work together to complete objectives and defeat enemies using special coordinate cards. The scenario is won when you complete all three objectives which can range from setting up the two sentry guns in the Complex to defeating the Alien Queen. 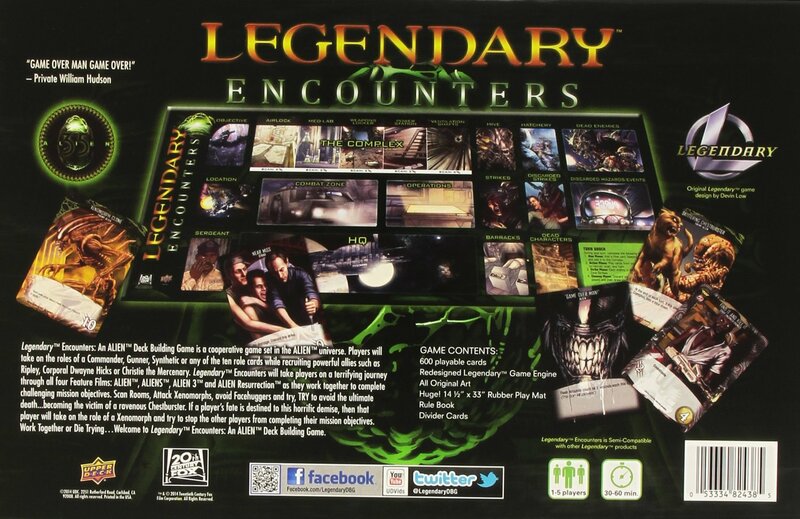 While I have only played through the first two scenarios and am itching to play Alien 3 and Resurrection, Legendary has really hit the mark thematically. The stress of the hive deck, the panic when an event or hazard gets triggered, the tension and combinations of cards makes for a fantastic deck building game. The game is not without faults though. Timing between completing objectives and the hive deck spawning can be an issue, particularly when multiple events trigger. The game can also be brutally hard, especially at higher player counts (for each player in the game more Alien drones are added to the hive) and you will die...many times. Purists might also take offense to the artwork which does not really honor the late HR Giger who brought the Aliens to life with his unique sense of creepy drawings. The card illustrations are...well, 'cartoony' but at the same time, strangely unsettling. That said, this is not a game for little-uns with its fair share of Chestbursters, gore and blood. 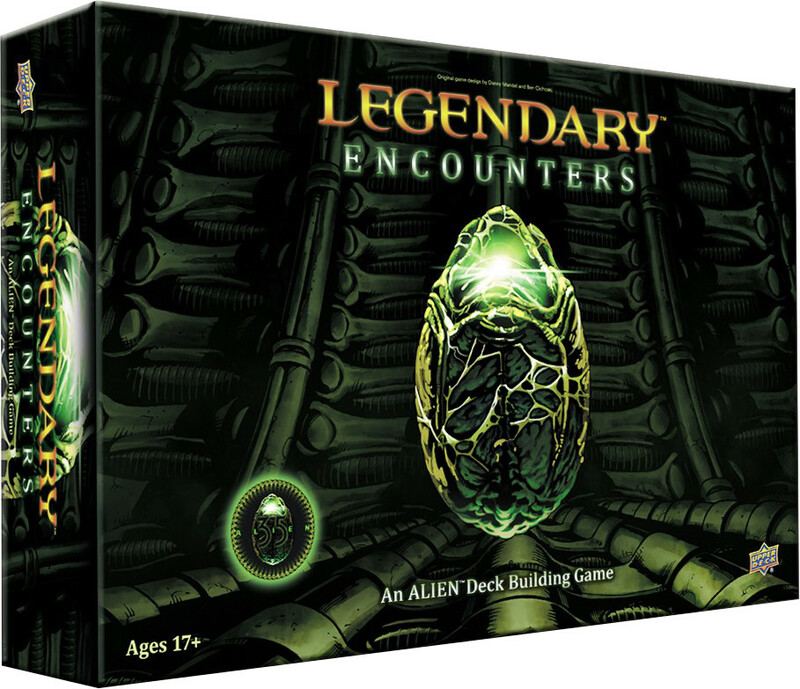 In conclusion, for anyone looking for a great co-op deck builder with a creepy thematic experience, Legendary Encounters: Aliens comes highly recommended. Mind you, you will probably want to re-watch the movies after your first play-through!